On Friday morning, Hoboken announced the City has reached an agreement with SUEZ to continue operating the city's water system. 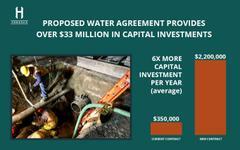 The deal will include much-needed investments in the city’s aging water infrastructure, and it stems from the kind of open, direct negotiation that Councilman Mike DeFusco called for between the city and the private water operator last year. At the time, Mayor Ravi Bhalla had threatened a lawsuit against the company, an action that could have destroyed any chance of progress if not for the intervention of the City Council. “Last year our city was on the verge of making a historic mistake in once again jumping into a protracted lawsuit that would only benefit lawyers instead of the residents of Hoboken, by entering into a lawsuit with SUEZ. Last summer, I demanded that the Mayor start a dialogue with the company and work towards an agreement that would make the investments in our water infrastructure that are so badly needed. The leadership shown by the City Council, particularly Ruben Ramos and Tiffanie Fisher, rescued our city from a legal battle that would have served no one and allowed us to reach a responsible agreement with SUEZ. This is a great first step to making much-needed investments in our water system, but this is not a silver bullet, it will not entirely fix the century-old problem. 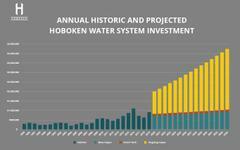 We can and need to do more and I look forward to improving infrastructure across Hoboken.